This is probably our most popular coffee mug. 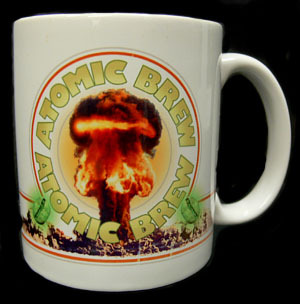 A great gift, the 'Atomic Brew' mug has a high resolution image of a nuclear blast with 2 coffee beans glowing green with radiation on either side. Image appears on both sides of the mug. Like all our mugs, this one is printed in full color, on a high gloss, 12 ounce ceramic coffee mug - dishwasher safe of course. For the history buffs and nuclear physicists out there, the nuclear detonation pictured is the 'Priscilla' test (part of the 'Plumbbob' series), detonated at Area 5 on the Nevada Test Site, June 24th, 1957. Nuclear yield was 37 kilotons. As far as the green glowing coffee beans go, yes, we know that they should actually be glowing blue (due to Cherenkov radiation) but green looked better.